Vancouver, British Columbia--(Newsfile Corp. - February 5, 2019) - CanAlaska Uranium Ltd. (TSXV: CVV) (OTCQB: CVVUF) (FSE: DH7N) ("CanAlaska" or the "Company") reports that drill testing of the Manibridge high-grade nickel zone, in the Thompson Nickel Belt ("TNB") Manitoba, has begun. CanAlaska President Peter Dasler comments, "We have a series of projects underway for 2019. The Manibridge project has already generated significant third-party interest, and as a Project Generator we are preparing it for future sale. Our key objective for 2019 is to significantly extend the West McArthur uranium project discoveries." CanAlaska Uranium Ltd. (TSXV: CVV) (OTCQB: CVVUF) (FSE: DH7N) holds interests in approximately 152,000 hectares (375,000 acres), in Canada's Athabasca Basin - the "Saudi Arabia of Uranium." CanAlaska's strategic holdings have attracted major international mining companies. 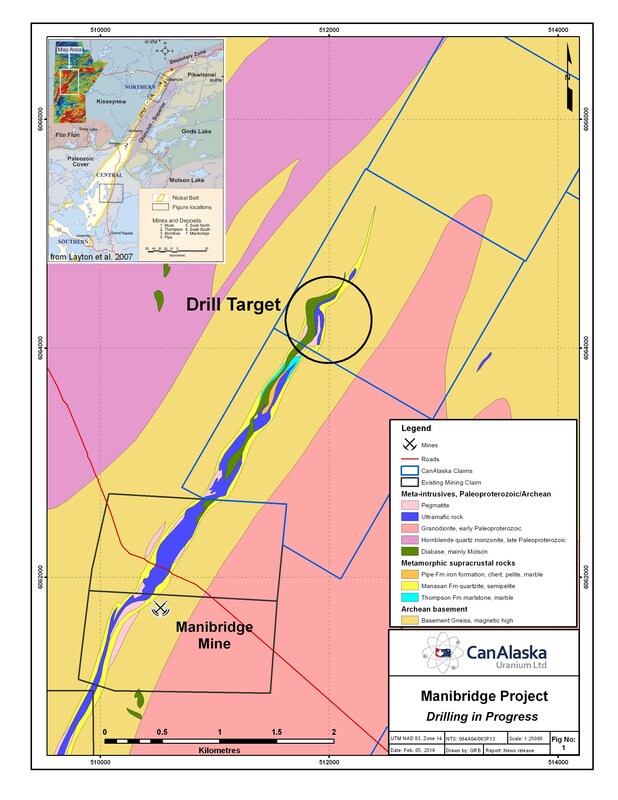 CanAlaska is currently working with Cameco and Denison at two of the Company's properties in the Eastern Athabasca Basin. CanAlaska is a project generator positioned for discovery success in the world's richest uranium district. The Company also holds properties prospective for nickel, copper, gold and diamonds. For further information visit www.canalaska.com.